But this helps in Sight-Reading... which is a step just before Sight-Singing. Here's a little tip to get you started. Print this Music Chart and put it next to you when you play. You'll have to reduce the size if you want to carry it around in your wallet. And... don't worry too much... after awhile, you will NOT need this Music Chart. 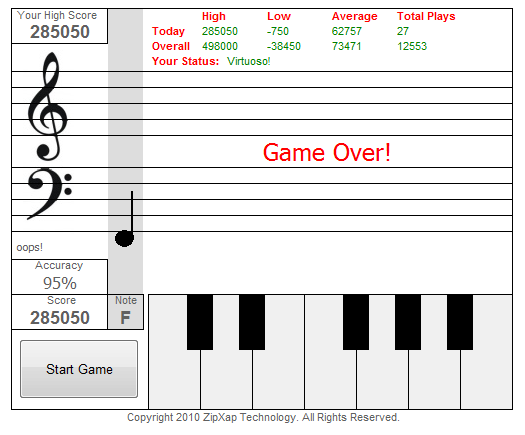 This Online Game is good for remembering the music notes. I had problems when it came to the extra ledgers lines above and below the staff. This Online Game will help me improve my Sight-Reading. Anyway... here's My High-Score of the first time I played.